In the war between cats and dogs, young pilot Claude D'Bonair is on a dangerous mission to a dark castle. 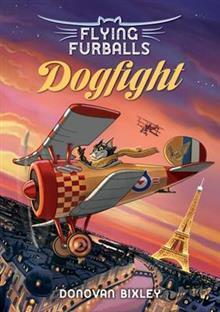 'Flying Furballs', a hilarious action-packed adventure series, captures the romance and excitement of the era at the dawn of aviation - set in a world of cats verses dogs. Put simply, Flying Furballs is pussycats, planes and Paris. Our hero is Claude D'Bonair, a young pilot in the cat air corp, keen to prove his worth to the older pilots and live up to the memory of his father. Will cats and dogs ever live in harmony again? Will Claude survive with his nine lives intact? In Book 1: Dogfight, Claude must fly a secret and dangerous mission deep into the heart of Dogz held territory to save the air corp's most famous dogfighter, Major Tom, who is being held prisoner in the Dogz castle HQ. If he fails it could spell cat-astrophe for the whole of katdom.